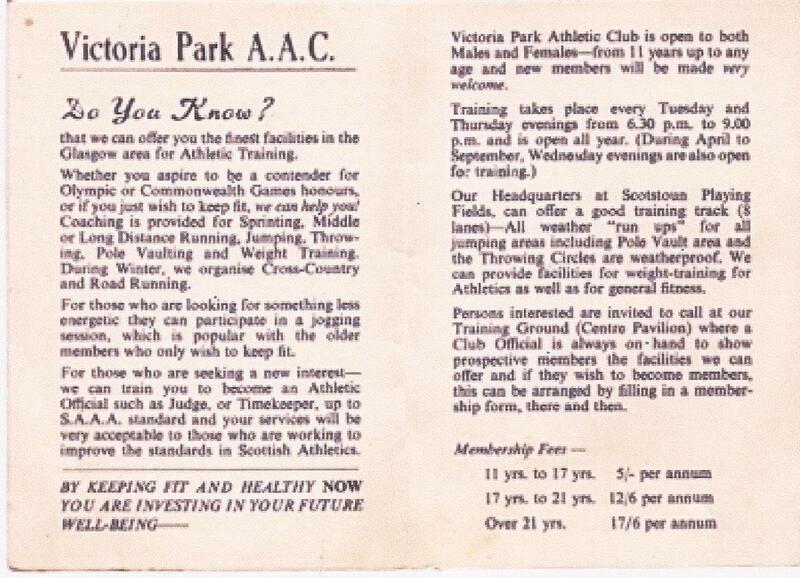 When I started running in the 1950’s, based in Clydebank, Scotstoun was the home of Victoria Park AAC and had been since their inception in 1930. There was a good cinder running track, a capacious stand and it was surrounded by football, hockey and rugby pitches giving a good, grass, perimeter for warming up and where very good training sessions could also be done. But it had not started life as a sports ground. Developed by the Glasgow Agricultural Society as a Show Ground in the late 19th century, it was used as a venue for sports from the start of the 20th century. As far as athletics is concerned, given its rural location, the ground was initially used for cross-country purposes but before starting on that there is an interesting article written by Hugh Barrow that we could look at. 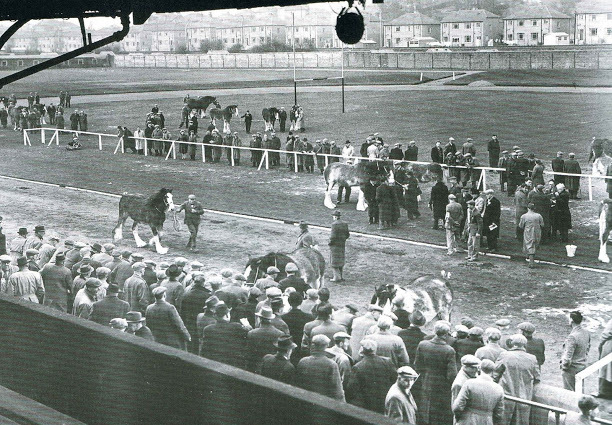 Losing the championship did not upset Clydesdale too much but running at Scotstoun seemed to please them: the biggest club in Scotland, they had no fewer than five sections in Glasgow and had been holding runs and races all over the city since 1885 – Maryhill, Thornliebank and Cathcart being most visited. They were also the organisers behind an Open Handicap and Team Race that was very well supported every November. After several years at Maryhill, they brought the race to Scotstoun in season 1904-5. The race was held on 19th November 1904 and the club handbook reported on the race as follows: “The Grand Open Handicap and Team Contest, with which we included an Open Hundred Yards Race, was held at Scotstoun Show Ground and proved a great success, though the Sprint did not fill as well as expected. Going through the ground for the first time, Sam Stevenson, James Reston and PC Russell were leading, running neck and neck and they finished in the order named, S Stevenson winning by 20 yards from Reston with Russell a little behind. The Handicap resulted as follows: 1. Alex Cross, Clydesdale Harriers; 2. RR Lambie, Clydesdale Harriers; 3. Jas Somerville, Motherwell YMCA Harriers. Seventeen Teams entered for the team contest which was won by Edinburgh Southern Harriers with a total of 12 points , Bellahouston Harriers being second with 36 points, and Hamilton Harriers third with 43 points.” The race was not reported on in the ‘Herald’ the available space being given to another attempt to cast doubt on the times of Alfred Shrubb’s famous race at Ibrox – there had been an attempt to discredit the timekeeping which had failed, and the new accusation was that the distances had not been accurately measured. Back to the race, there were four laps and the sprint had been introduced to entertain the crowd who had paid to enter while the runners were out in the country. After the race, the presentation of prizes would beheld the following Wednesday in the Harriers club rooms at 33 Dundas Street, tickets priced at three pence each. By the start of the War in 1914, more national championships had been held at the Show Ground than anywhere else in Scotland. Compare the top four venues – Scotstoun 10, Hampden Park 3, Tyncastle 3, Musselburgh Race Course 3. The Clydesdale Harriers Handicap and Team Race went on using the venue right up until the start of hostilities. Such was the high opinion held of the venue that the International Cross-Country Championship was held there on March 23rd, 1907. The report was short but for such an occasion deserves to be quoted. England had six in the first seven, the interloper being Scotland’s Tom Jack from Edinburgh in fifth place. Individual first three (all English) were A Underwood (54:26 3-5th), Geoff Pearce (54:48) and S Welding (54:50). Unfortunately, after 1918 the area was very built up and new venues had to be used – the Handicap and Team Race went to Rouken Glen, and the National tried a variety of venues such as Rouken Glen and Musselburgh Race Course before settling on Hamilton in the mid-20s. And Scotstoun became a track and field venue that would host some of the best meetings in Scotland and see some of the best athletes in the world come to Danes Drive, to the home of Victoria Park AAC. Reports say that the track and stand were in place by 1915. The War would of course have influenced use at that time and after 1918 there were several local clubs that would have used the track. 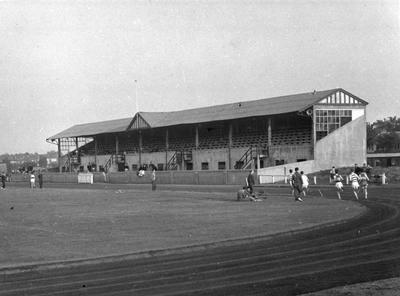 The major tracks in Glasgow at the time were at the football clubs with Hampden, Ibrox and Parkhead being among the best in Scotland, capacity for spectators in the tens of thousands and regular sports meetings such as the big ones organised by Rangers, Queen’s Park, Celtic Football Clubs, the Glasgow Police Sports, and the smaller ones such as St Peter’s AAC or Maryhill Harriers own Sports. There were also some smaller arenas such as the one at Helenvale in the east, and Westerlands in the west of the city which also had regular meetings. For these reasons the track was probably less well known or used until the formation of Victoria Park AAC in 1930. Another possible reason for the track being omitted from the track championship rota has been suggested by Alastair Shaw who trained and coached there and that is that the track was slightly banked. A new club with all the impetus that and drive that new clubs have, with a good track to train on was a welcome addition to the whole area of the west of Glasgow and the surrounding area. The club and the track prospered – existing clubs felt the draft and the track was a large part of the attraction. In one spell of about 18 months in the 1930’s Clydesdale Harriers was losing a member a month to Victoria Park and the reason given was that they felt that training there would improve their athletics. I have seen the letters. The club was ambitious and successful right from the start and the track and grassy perimeter helped with that success. 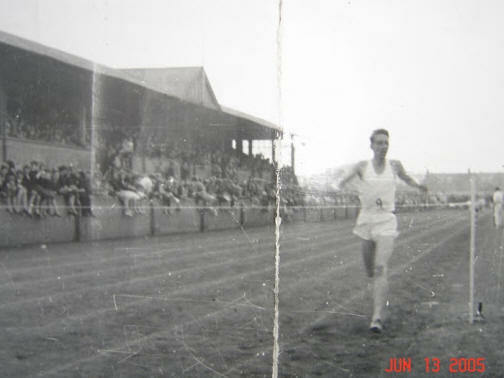 The track had been noticed before then by the Scottish Schools and the Inter-Scholastic Sports, pre-cursor of the SSAA Championships were held there in June 1936. It was after the second war however that the venue became well known. Victoria Park was one of the very top Scottish clubs throughout the 50’s and 60’s and hosted many fixtures there. There the inter-club matches, there were triangular fixtures, there were challenge matches. Edinburgh Southern, Shettleston, Heriots, Jordanhill College, Clydesdale Harriers, and all the best clubs came to Scotstoun and all were soundly beaten at one time or another – for instance there were three triangular matches against Clydesdale and Shettleston in the mid-50s. VP won them all with the score at the one they hosted at Scotstoun being VPAAC 84, CH 36, Shettleston 26. They won the 100 yards, 220 yards, 440 yards,880 yards, Two Miles, 440 yards hurdles first and second races, 4 x 110 relay, 4 x 440 relay, high jump, javelin and long jump! The club was a big club and it was doing just about everything right: a lot of focus is on the road runners at that time but the track and field men should not be ignored. But the venue was not only used by the one club. 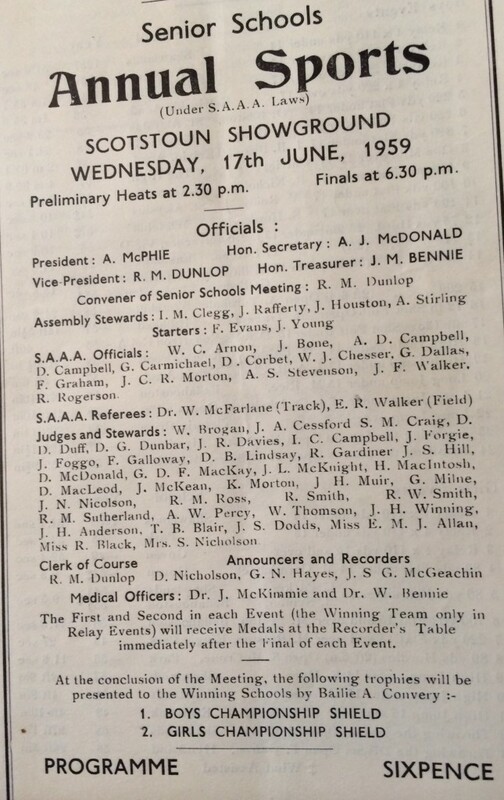 The Scottish Schools Championships had begun as the Inter Scholastic Sports back in 1900 but became the Scottish Schools Championships from 1948. The championships were held alternately in the East and West of the country with Westerlands being the regular track in the west. These were for boys only with the girls championships not starting until 1953. For the first few years the two events were held on separate days in the calendar but it soon became clear that it would be easier for the schools to have the same date to work to for both so in 1955 the boys championships were held at Goldenacre in Edinburgh and the girls at Westerlands. The policy then was to have each championship on the same date but with one in the east and one in the west. Thus in 1956 the girls were in Dunfermilne and the boys in Westerlands, in 1957 the girls at Westerlands and the boys at Goldenacre, and so on. Westerlands was always the favoured venue in the west. Scotstoun was not involved until 1968 when the Scottish Universities championship was being held at Westerlands. It was the boys who went there that year but in 1969, the girls were at Westerlands and the boys at Scotstoun – the first time that both championships had been in the one city. In 1970 the girls were at Scotstoun, the following year it was the boys turn. Scotstoun was a regular championship venue for the first time. It continued to be so until boys and girls championships combined at Grangemouth. The track received some criticism in the 70′ – at one time the wind was blowing dust from the track all over the place and it was more than once remarked that the track was not one of the fastest in the country. The schools were not the only group to start using the track for championship meetings. 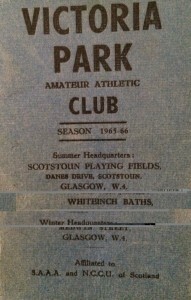 While the men had been holding district championships for decades, the women had no such event until the 1950’s when they began what they called the West Trials – trials for choosing the team for the Inter-District Championship – but in 1959 they were called for the first time the Scottish Women’s West District Championships and were held at Scotstoun.. These were usually held in May with the date fluctuating. 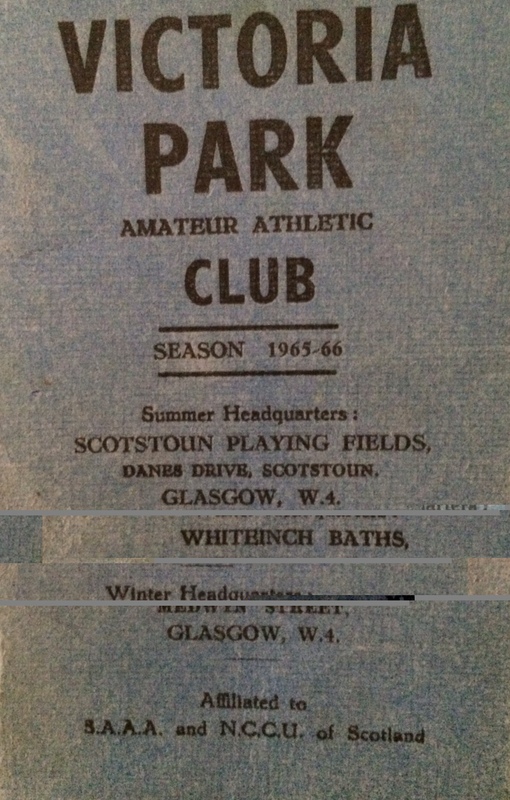 In 1959 the Championships were on 18th May and the following Saturday Scotstoun hosted the actual SWAAA East v West Championships. All through the 50’s and 60’s Scotstoun was buzzing. Not everything was perfect – the track was not the fastest although several records were set on it and Charles Bannerman recalls that there was a significant step up from the track to the infield and high jumpers with a long run up had to find a way to accommodate that in their approach. Scottish Schools training days were held there – Hugh Barrow and John Anderson remember one that John organised in the mid 60’s when the coaching staff included Alex Naylor, Eddie Taylor, Sandy Ewan and Michael Glen plus Vic Mitchell, Mike Lindsay, Peter Warden and Menzies Campbell all to assist the young athletes plus athletes Graeme Grant, Hugh Barrow, Sandy Robertson and Don Halliday as ‘coaching assistants’. With the advent of all-weather tracks, Scotstoun became much less popular and less used for championships or official meetings, the preference being for Meadowbank, Coatbridge, Grangemouth, Pitreavie and latterly Crown Point. In 1973 Ron Marshall in the ‘Glasgow Herald’ spoke of a rumour that Scotstoun was to be upgraded to all-weather status. Nothing came of it, and in 1976, the ‘Herald’ reported on 17th May, after the Glasgow International Mile, as follows: “Danie Malan (South Africa) had just two observations to make immediately after winning the Glasgow International Mile at Scotstoun on Saturday. 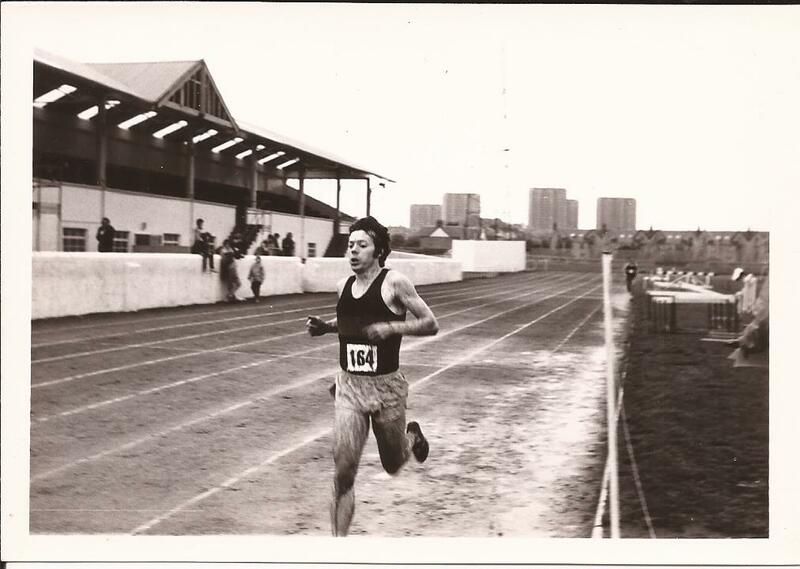 First, he could not recall when he had last run on a cinder track in a major city, and second he opined how unusual it was to have no lap times announced or even called from the edge of the track.” It was to be another 20 years before Scotstoun would be upgraded. Then in the mid-90s it underwent a massive regeneration with a superb all-weather track laid. In 1999 the British Milers’ Club held its first ever Grand Prix in Scotland at the venue and records were set in every event with a sub-4 minute mile (3:59.64) being run by Andrew Graffin , the best-ever BMC women’s 1500m run by Ann Williams of 4:10.84 and Michael Hassan ran the fastest U17 800m of 1999. It was the GP Final for the year and all the best athletes from England, Ireland and Wales were there to boost their points and so their prize money. Scotstoun showed that afternoon what a good track it was and what fine facilities the revamped stadium could provide. It was held again at Scotstoun in 2000 and 2001 and the well-known British coaching officals – Frank Horwill, Brendan Hackett, Norman Poole, Mike Down and more were all present at one or all of these meetings. Scotstoun went on to host National Championships, International meetings and all sorts of coaching and training days and enjoyed something of a rebirth from the start of the twenty first century. 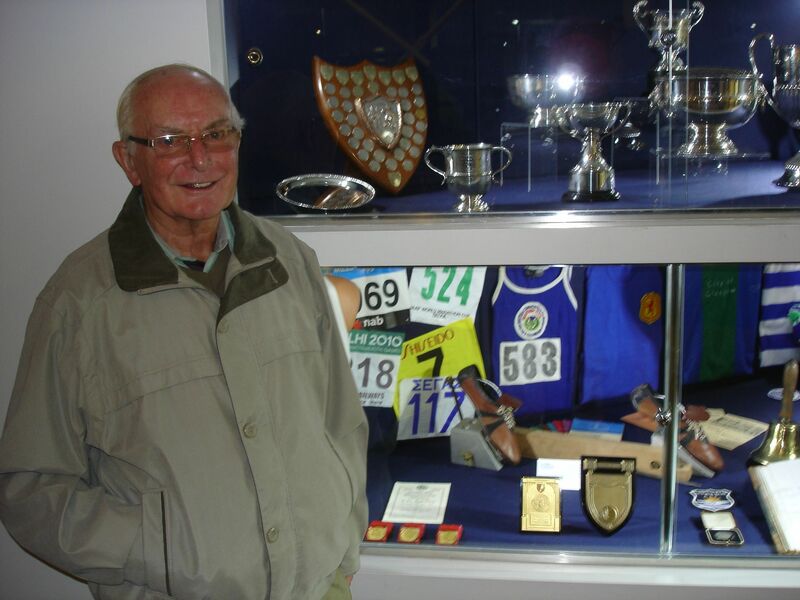 The Scottish Senior Track and Field Championships came to Scotstoun at the start of the new century and stayed until 2007. The stadium saw Senior Championships, Combined Events Championships (2002), Combined East and West Championships (2005 and 2007), Masters Championships (2006) and Under 20 and Under 23 Championships (2006). There were three GB international matches – on 2nd July 2000 Great Britain & Northern Ireland took on the might of the USA, on 29th June 2003 it was Great Britain & Northern Ireland v USA v Russia, and on 5th June 2005, the same three nations took part in another triangular fixture. There were also international meets with stars from all corners of the globe appearing at the track. The venue is now about 100 years old and has hosted first cross-country and then athletics After 84 years, it is still the home of Victoria Park – but they now share it with Glasgow Warriors rugby club who seem to be the dominant partner. The rugby team require sole use of the stadium for various fixtures with temporary stands set up on the track thus locking the track for training for weeks on end – usually at the start of the summer season. If the Warriors want an extra stand put up for a cup or league match, then they usually get it and the athletics has to take second place on these occasions. It’s not clear how this will work out but athletics has survived and prospered at the stadium from the nineteenth century overcoming all obstacles – no doubt it will continue to do so, although the days of proper international meetings or national championships have probably gone now that an artificial grass surface has been laid on the infield making throwing events impossible. A famous venue.